As much as I hate to see summer end I am looking forward to cooler temps. 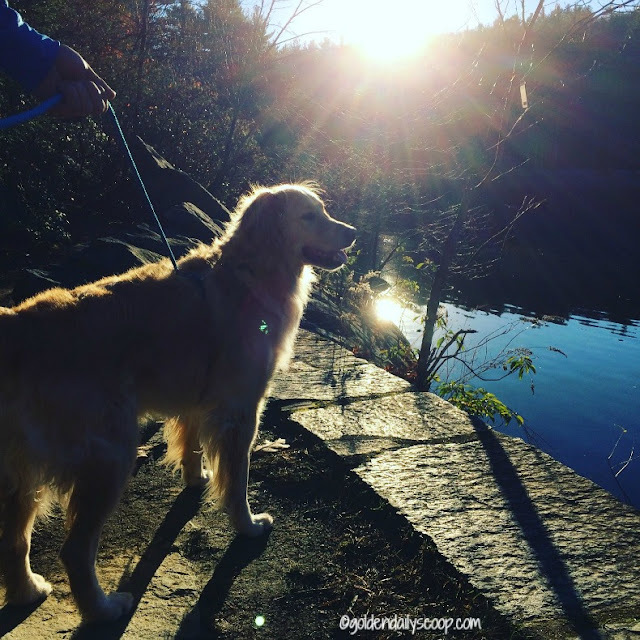 New England Fall weather is beautiful, you can still enjoy the warm sunshine but with the cool, crisp air and most importantly the foliage is breathtaking. One of our favorite things to do with the Goldens is taking trips to our favorite dog-friendly parks. 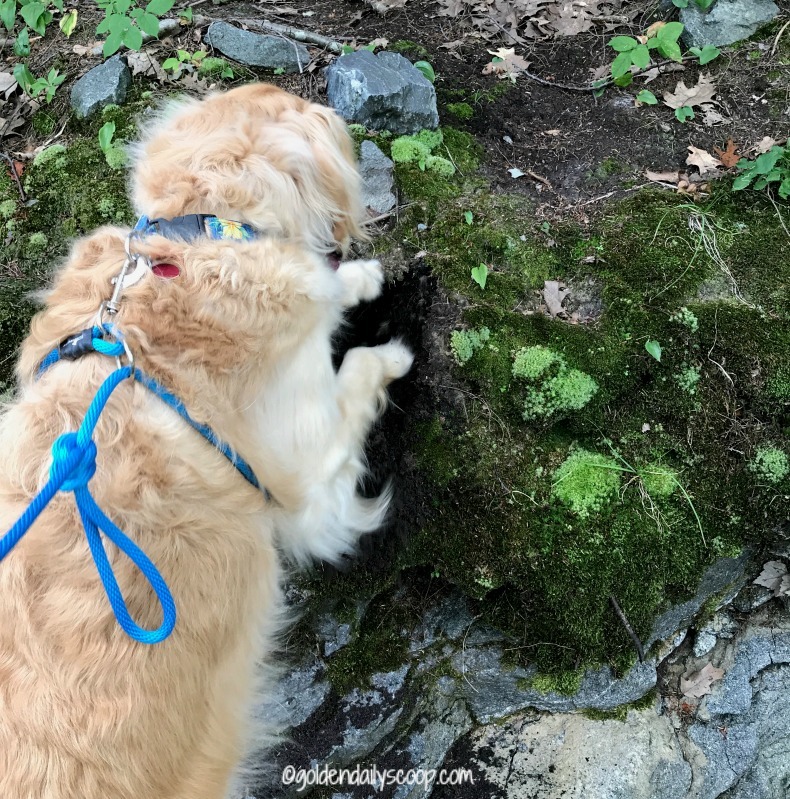 They love exploring fun trails and different scents while we enjoy just being outside in nature with them. Today we thought we would share a list of essentials items we always take along with us to the park. With the hurricanes that have devastated Texas, Florida and beyond the past few weeks we all know how important it is to be pet-prepared when disaster strikes. The same goes for when you are headed out to your local dog-friendly park, it's better to be prepared and safe than sorry. The Goldens almost always have their collars on with their up-to-date tags attached. That along with being microchipped is a safe practice in the event that your dog gets away from you and lost. Seems like common sense but if you only knew how many times we've hit the road and realized we forgot the leashes. lol Even if you are going to an off-leash park, it's always best to have one in case you need it. The Goldens are always leashed, the chipmunk temptation is just too much for them to handle. 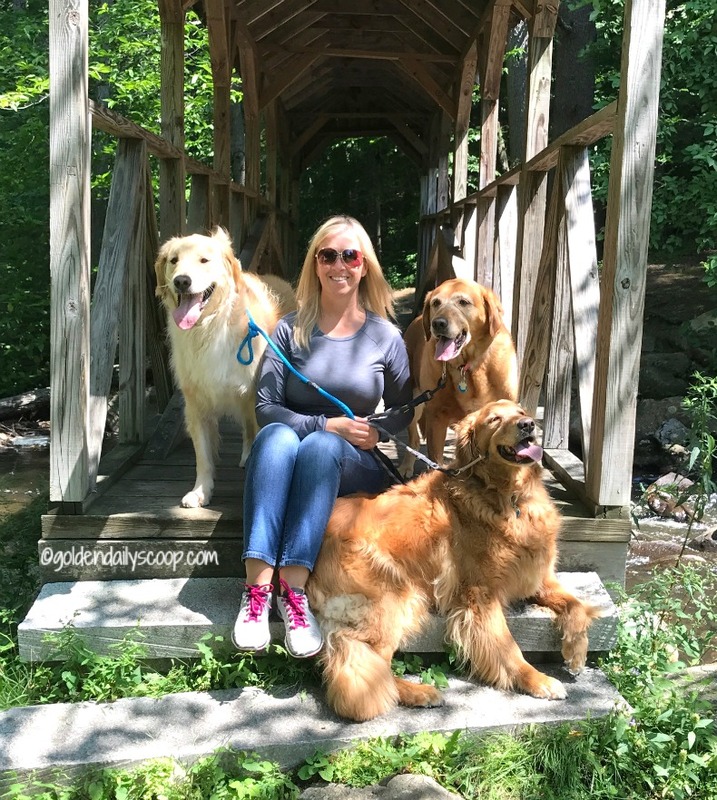 The first thing I do when we get to the park is wipe the Goldens down with Flea + Tick wipes. Although we treat them monthly, I like to have a little extra protection. A few years ago we tried Pet Naturals of Vermont brand and we have been using them ever since. Yes, we always have our phone with us to take pics but I still like to use my dslr camera. 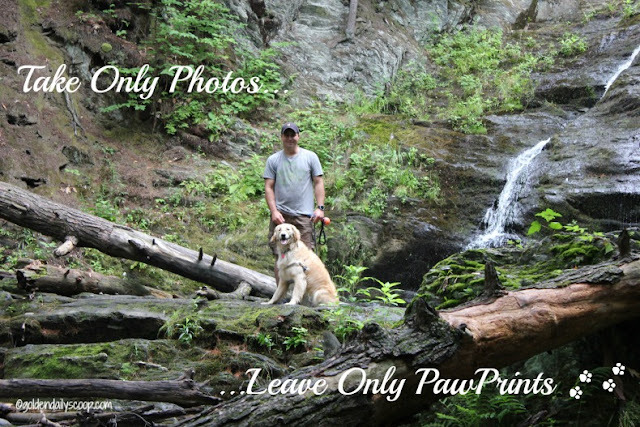 There is nothing better than taking photos of your dog with nature as your backdrop. After all that exploring and posing for photos, we always make sure to stop for a water break. If we are going to be out for an extended period of time I will bring along some treats as well. You know what happens after they have had their snack. Be prepared for when nature calls to scoop their poop! Once we head back to the car I like to quickly run a brush through the Goldens coat to remove any leaves, twigs or heavens forbid - ticks! If your dog is anything like ours, they like to get dirty while exploring. They will step in any puddle they can find, attempt to go in the water if there is any and they are famous for digging holes! The last thing I want to do after leaving the park is clean the car, this is where a cargo liner comes in handy! Disclosure: Golden Daily Scoop was sent a Molly Mutt car seat cover for review purposes. All opinions expressed are our own. Molly Mutt is not responsible for the contents of this post. Molly Mutt is known for their beautiful line of Pet Bed Duvet Covers and now they just introduced a line of Car Seat Covers in 8 colorful patterns to keep your seats protected. 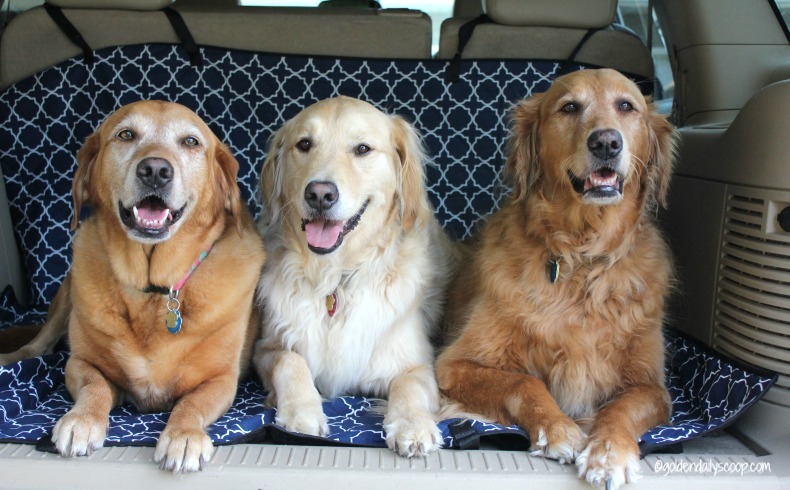 What sets a Molly Mutt car seat cover apart from the rest? It's multi-functional, it works as a car seat cover, a hammock or a cargo cover. 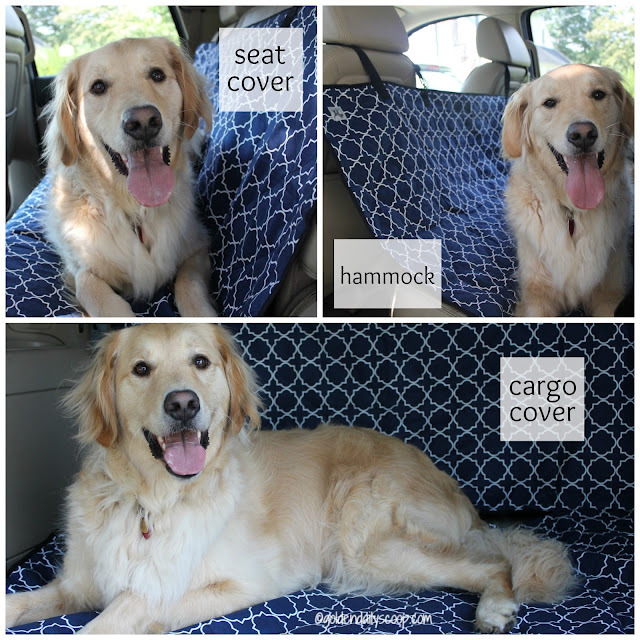 So depending on how you travel with your dog, you are sure to keep your seats protected and your dog riding in style. It fits all vehicles with headrests and has adjustable straps to easily put on and off. It also has seatbelt slots, seat anchors and a non-slid backing to stay in place. When we travel, the Goldens go in the cargo area of our Chevy Tahoe and as you can see this cargo cover is plenty big enough for all three of them to comfortably fit on. Having a Molly Mutt car seat cover is a huge time saver when we get home from the park. 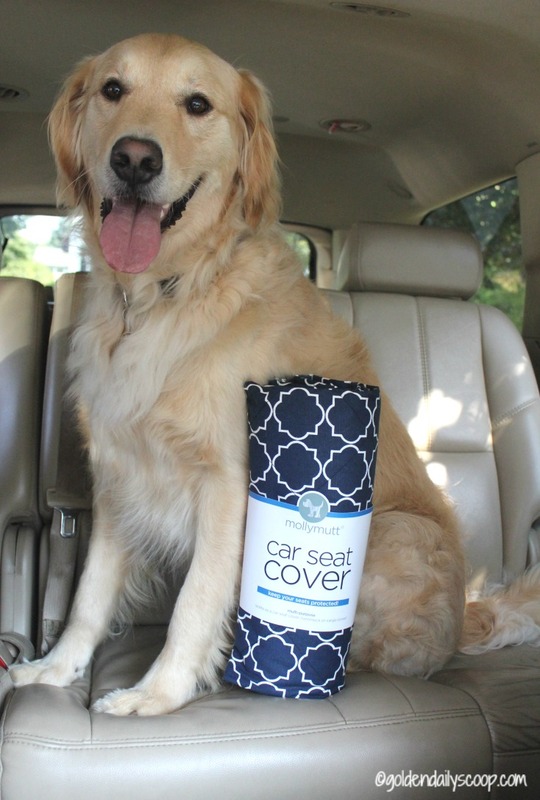 Their durable fabric makes it easy to wipe clean and shake dirt or fur off of and who doesn't love to have their dogs ride in style?! 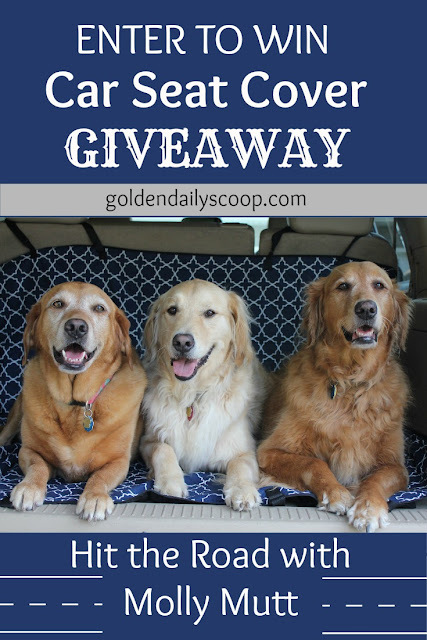 Enter win a Molly Mutt Car Seat Cover! I want to take the New England Fall cruise one year. It's so beautiful from the photos I've seen. Molly Mutt seat covers are awesome! I really like the Papillon design! They make some great products. It looks like you all had fun in the woods! Good to get out there while the weather is still nice. We like the papillon pattern the best. My favorite is the rocketman car seat cover. I like the rocketman cover the best. This would be great to have. I have a couple of Molly Mutt dog beds and a crate cover and I love them. I'm excited they've made a car cover since all the ones I've seen and bought are so boring and their patterns are rad. i like the rough gem pattern, would go well with the interior of my car. i love these car covers. It sure is versatile! It would be great to have something to keep my car from being completely covered in dog hair! I really like the karma chameleon! I really like the rough gem pattern. It would match my black interior the best. I like the papillon pattern the most!! I like rocket man. My sheepdog could use this. I love the Papillon pattern. I think I like the rough gem pattern best! I like the karma chameleon and lion's roar patterns. I really like the amarillo by morning. My overall favorite from their other products isn't available on these, unfortunately, but of the styles that are, I think I like the Rocketman one the best.